From dotting the i’s and crossing the t’s, suggesting a single African currency, and mending relations with Rwanda, President Cyril Ramaphosa and international relations minister Lindiwe Sisulu look set to lead South African foreign policy in a different direction. By CARIEN DU PLESSIS. There were whoops and gasps from the room, then applause. Just last month, former president Jacob Zuma wanted to hang on to the presidency a few months longer so he could introduce Ramaphosa to the AU and the Southern African Development Community. Former Nigerian president Olusegun Obasanjo welcomed Ramaphosa warmly, and congratulated him, and also “all of the people in South Africa for their transition”. A high-ranking member of the Nigerian delegation, when asked about his country’s views, said the rest of the continent shared in the South Africans’ relief at the transition. Despite reports about improving relations over the past two years, this was difficult with Maite Nkoana-Mashabane still in the foreign relations portfolio. Rwandans felt she was too close to opposition defector, former Rwandan Armed Forces chief of staff, General Kayumba Nyamwasa. They both served in diplomatic postings in India more than a decade ago. “I was talking earlier with President Kagame, and we have decided that we are going to put the relationship between South Africa and Rwanda on a much better footing,” he said. “And the gaps and challenges that we’ve had are going to be resolved and we’ve got two very outstanding, beautiful ministers of international relations who are going to work on this immediately,” he continued. Rwandan foreign minister Louise Mushikiwabo and her newly-appointed South African counterpart, Lindiwe Sisulu, now have to resolve the nitty gritty. Still, it’s difficult imagining mending bridges like this, say, two months ago. Sisulu also explained some of the intricacies of the African Continental Free Trade Area agreement due to be signed in Kigali by AU heads of state on Wednesday. South Africa, had some objections on technicalities and deadlines, which she outlined, but she added South Africa would sign the agreement. Sisulu sheepishly said it’s the first time that she’s had to cross so many t’s and dot so many i’s. Even though she’d been a minister since 2001 – of intelligence, housing, defence and public service and administration – continental diplomatic negotiations about the small print are new to her. Ramaphosa, meanwhile, held his own as part of a panel of economic experts – in fact, officials said he timed his SAA chartered flight in such a way that he’d be on time for this forum. It’s been a few years since South Africa had a president who could do that. First there was some PR about the signing of the agreement being a historic one. “This is a moment for the African continent,” Ramaphosa said. With this, Ramaphosa is perhaps signalling that he’s not only South Africa’s businessman-president (many in the continent have in the past questioned his motives for playing political envoy roles in countries where he was perceived to have business interests), but that he has the continental picture in mind. As a businessman, he must also be aware that South Africa is sometimes regarded on the continent as a bully. “Maybe [good, profitable trade] needs to have an African currency that all of us can utilise,” he said, drawing parallels with Europe, saying an African currency that could go one to one with the dollar would free people here of “the colonial mentality”. Ramaphosa said the fixing of the Rwandan visa issue spoke to this goal of a free trade area and the free movement of people on the continent. In the past few days he also completed a whirlwind tour of neighbouring countries in the Southern African Development Community, to lobby the region’s position. Quite helpfully the region has just agreed on the three representatives it would send to the 15-member ministerial support structure to the AU chairperson’s office as part of the continental body’s reforms. Just a few months ago SADC had major reservations. 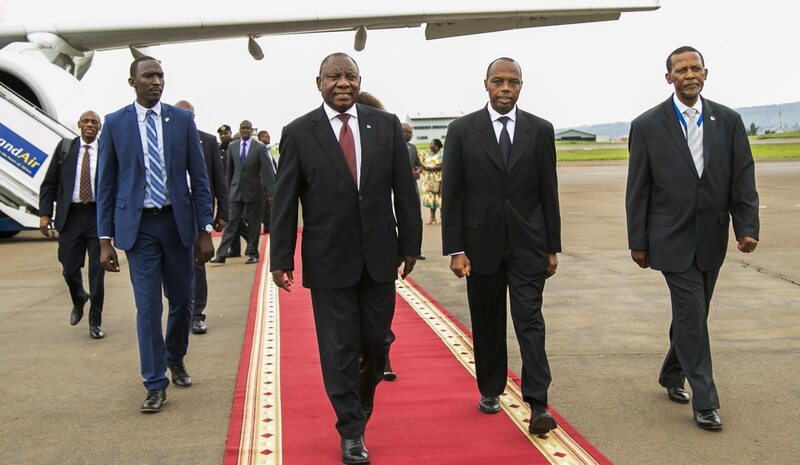 Photo: SA president Cyril Ramaphosa arrives to Kigali, Rwanda, 20 March 2017 (Photo courtesy of Rwandan government).